This technology is under development by computer scientists at the University of California at San Diego. They were able to demonstrate this teleduplicaiton tech by photographing a whole ring of keys that were on a table from 195 feet away using a telephoto lens. Believe it or not, they were able to duplicate all the keys on the ring. 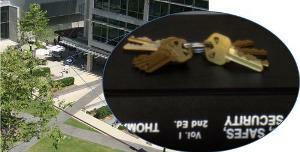 They have even claimed to get duplicates from pictures of keys taken with an ordinary cell phone camera. So, what does this mean? It means you should probably be wary of displaying your keys in public. I’ve heard of scams where ordinary cashiers take pictures of their customer’s credit cards using cell phone cameras, then use the numbers to purchase goods illegally. This teleduplication technology takes this identity theft scam to a Sneakey level as scammers can get the information to break into someone’s home.